Lines from the song Dr. Wu’ by Steely Dan…a band that really consisted of two songwriter/musicians, Donald Fagen and Walter Becker. Much like ourselves, they spent most of their time buried in their studio writing songs and surrounding themselves with world class musicians. In fact, we took our name from their inspiration. After years of constant urging from their fans, Steely Dan started touring. Understanding that our fans are of utmost importance to us, this recording was made to satisfy the constant requests to see Dr. Wu’ in a live performance. 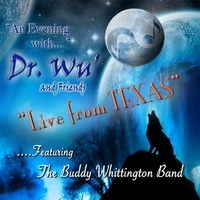 Dr. Wu': Texas Blues Live! An awesome 6Star recording! Dr. Wu' (Jim Ashworth & Bryan Freeze) with their 3rd output. A live album and a great one! The download is the perfect gap until the CD/DVD (Yes, there will be a CD available with a Bonus DVD of the concert! ), is in stores hopefully at the end of June 2012. Almost 70min of awesome music! "Live From Texas" was recorded in 2011 just outside of Fort Worth on a hot summer night. 15 great tracks are played by Dr. Wu' & Friends featuring The Buddy Whittington Band plus Gary Grammar on the harp. All tracks except the first were written by Bryan & Jim with a little help from Buddy on a few tracks. Only the first song Bo Diddley's "I'm A Man" is new all others well known from the Vol 1 & 2 of the "Texas Blues" Project. As we have different musicians on the studio recordings the live album has the great "Buddy Whittington Band" on every song. They gave a new approach to every song and made them more than interesting. The members of the band, "Mouse" Mayes, git & voc, Mike Gage, dr, Wayne Six, bass and Buddy himself on the guitar are a tight unit and there isn't a boring second on the whole recordings! Bryan Freeze made a very good job in producing these audio recordings. It sounds great! Please support Dr. Wu'! The world need that kind of "real" music from "real" musicians in these weird times!. On "YouTube" you can find a cool trailer. Have a look! This is TEXAS BLUES at it's very best !!! Dr. Wu' (Jim Ashworth & Bryan Freeze) along with The Buddy Whittington Band ( Buddy Whittington,Michael (Mouse) Mayes,Wayne Six and Mike Gauge ) and Gary Grammar have done us proud here in Texas.